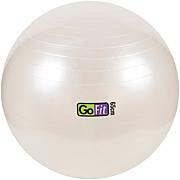 With the exercise printed directly onto the ball, the GoFit Professional Grade Core Stability Ball is a fun, yet challenging way to stretch, tone and tighten your body. What makes the GoFit Core Stability Ball so challenging Unlike training on a stable, flat surface, the ball is a round, unstable surface, so you not only train the primary muscle groups, but also the smaller stabilizing muscles as well. 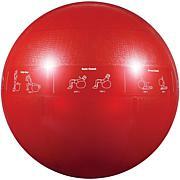 The stabilizing muscles are small, yet very important muscle groups primarily used for balance, alignment and posture. The ball total body workout is very efficient, allowing you to see the results you want in a much quicker period of time. Im using this with my Drs okay. I have degenerative disc disease in my lower back. 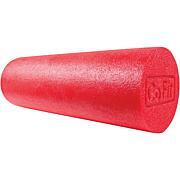 I need to strengthen my back. Im hoping this will do the trick.Please ask your dr before using if you have health issues.The quality & price are great,Delivery was very fast. Love it! Didn't think it would be strong enough to hold me but I was wrong. This one is lots nicer. I use it everyday. Every one should have one.